I guess this should go without saying, but I am going to say it anyhow: two flashes are better than one. Now you must be wondering why? For starters, two flashes will get you a higher score on the GAS scale. (G.A.S. stands for Gear Acquisition Syndrome). This alone is a good reason to get two. But there are lighting oriented reasons as well. For some tech talk and a multi flash bracket tutorial, hit the jump. This is the most obvious reason. If you need more lighting juice, more flashes will surly satisfy that requirement. And in some situations, you will need more power. If you are shooting in daylight and trying to beat the harsh sun, a single speedlite is hardly enough. Tow speedlites will give you twice the power at the same aperture. 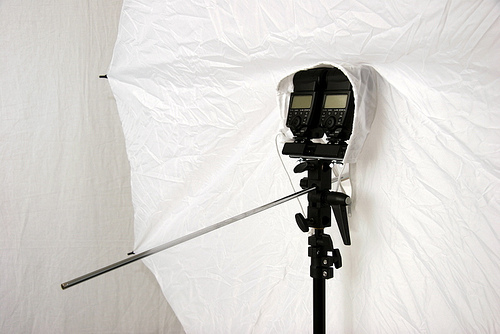 Two flashes are also great if you are using a light sucking light modifier like a softbox or an umbrella-softbox. While those light modifiers provide excellent soft light, they are also taking some major stops of your flash power. Using two or more strobes can help you “get through” with more light on your subject. Lastly you may want to be known as the guy who does insane genius lighting rigs with 12 flashes and more. OK, you probably don’t, but the link was too cool to not share. OK, so you don’t need more light. How about faster recycle time? Using two speedlites you can keep the same lighting you had with one flash buy pop twice as many shots in the same time frame. Shooting with good rhythm is crucial when working with a shy model or when you want to well, amm, shoot more. It also works great when you want to take a sequence of images all lit with a speedlite. Consider you had one flash set on 1/2 power. With my SB800 and Eneloop batteries this means a pop every three seconds (or two pops about every six seconds). If I use two flashes at 1/4 power, I can get the same light only with four pops every 6 seconds. OK, so using two speedlites is a cool thing. All you have to do is put them together. 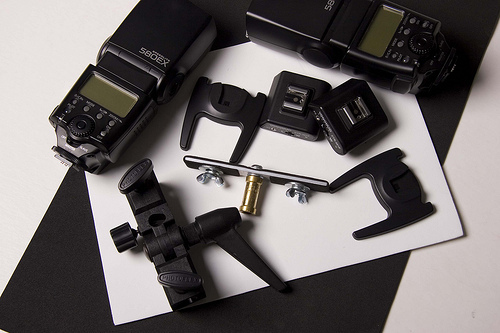 This can be done by using a dual flash bracket. You can buy one. Or of course, you can make one – courtesy of LariMarco. Cut about 6 inches of the flat aluminum rod. The length will depend on how you mount the speedlites. Drill three (3) 1/4″ holes – one at the center and one on each side. 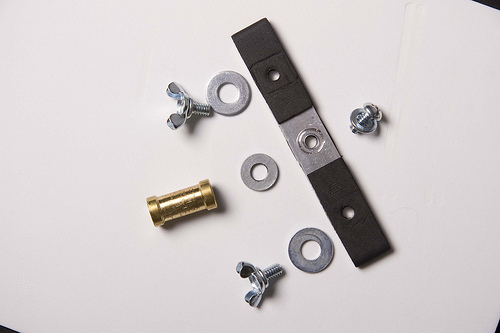 Assemble the parts as shown in the picture below. 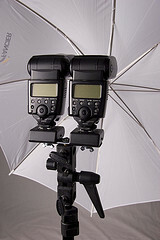 There you have it – a dual speedlite mount. Thanks for posting this. I realized at the last minute I needed another multi-flash mount so, inspire by your DIY, I grabbed a dual camera plate I had, a spigot, and a couple of cold shoes and am good to go.